Interior design magazines and blogs are always telling us to declutter our lives for a sleek, minimalist look. They encourage us to hide our belongings, use neutral colors and limit what we have on display. While this is ideal for many, some of us don’t enjoy this method of decorating. Instead, we want our homes to be filled with life, interest, and excitement. Maximalist decorating is the exact opposite of minimalist and encourages excess. From striking colors to shelves brimming with ornaments and trinkets, it’s a fun way to decorate and personalize your home. So if you’re sick of trying to be minimal, here are some easy ways you can try to create a maximalist effect instead. Patterns are an integral part of a maximalist look, especially if they clash. You could combine tribal prints with colorful florals and polka dots for example. Start with a multicolored patterned piece like an armchair or rug which will act as an anchor within the space. Then pick out hues from this piece to influence the size and color of other patterned items you could use. This could be curtains, wallpapers, and throws for example. Using different scales of clashing patterns is an easy way of creating a maximalist feel within your home. But if you’re struggling to get this right, look at the work of Juan Pablo Molyneux and other interior designers for more inspiration. Layering different textures is a vital aspect of maximalist decorating and can create a cozy and welcoming vibe. You can combine leather sofas with velvet, linen and silk throws, and cushions. 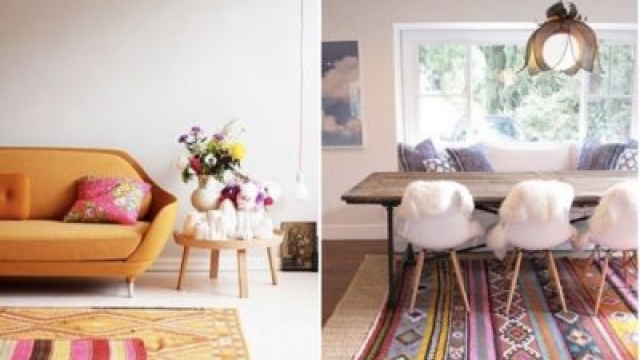 Layering fluffy rugs on top of woven ones is another option. Their sizes and color scheme should also vary if you want a dramatic look and feel. In addition to this, think about the walls of your home and how you can add more textures to them. You can hang animal hides or oversized painted canvases. Embossed wallpapers and wooden paneling are also fantastic ideas. The possibilities are endless. Visit a homewares store and start combining different textures together. Stay open minded and don’t be afraid to try new things. You may be surprised just how well they work. Unlike minimalist decorating, a maximalist style encourages you to display your belongings. So create a large display within your bedroom or living room where you can display your most treasured items. These could be items you collect such as candles, shells or teapots. Or an array of possessions that hold sentimental value to you like photographs and childhood toys. Not only will this make your home feel more personal but it can also tell people more about you. To create your display look at large shelving units and cabinets. You should also consider displaying your belongings on a smaller scale on end tables and trays around your home. These are just a few examples of how you can create a maximalist feel in your home. Why not look online or in magazines to see what other homeowners have achieved with this exciting style of decorating. Previous Previous post: Costly Errors That Stupid People Make When They Go On Holiday – So You Know To Avoid Them! Costly Errors That Stupid People Make When They Go On Holiday – So You Know To Avoid Them!